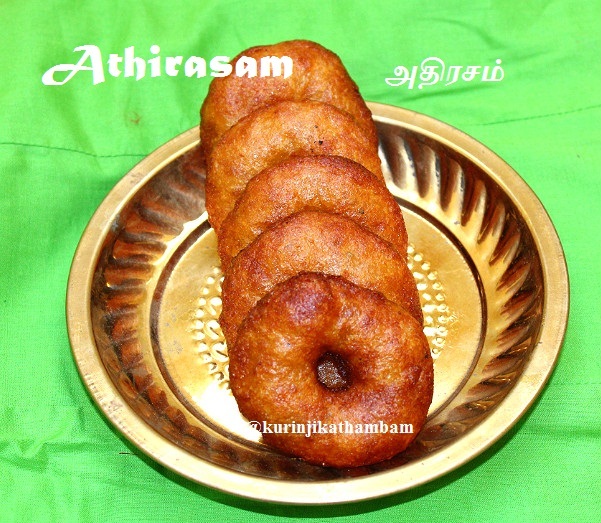 Athirasam is a traditional Tamil recipe. But not many make it puffy as it should be. I learn the method to make it puffy from my Sithi (mother’s sister). 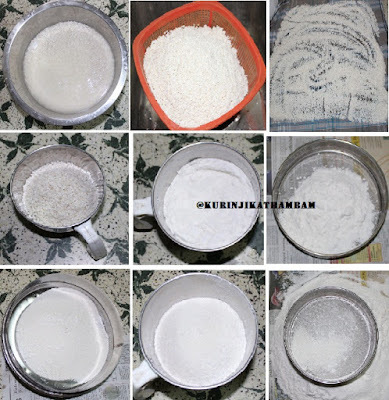 The trick is to ensure that the rice powder is coarse and the syrup consistency. This sweet is old but gold not only in color also in taste. 3. Grind them into batch wise using the mixer grinder. You should not grind into a fine powder. 4. Sieve the ground flour using the coarse siever (rava sallladai). So that some un- ground rice particles gets deposited at the top of the siever. Keep this in a separate plate. 6. 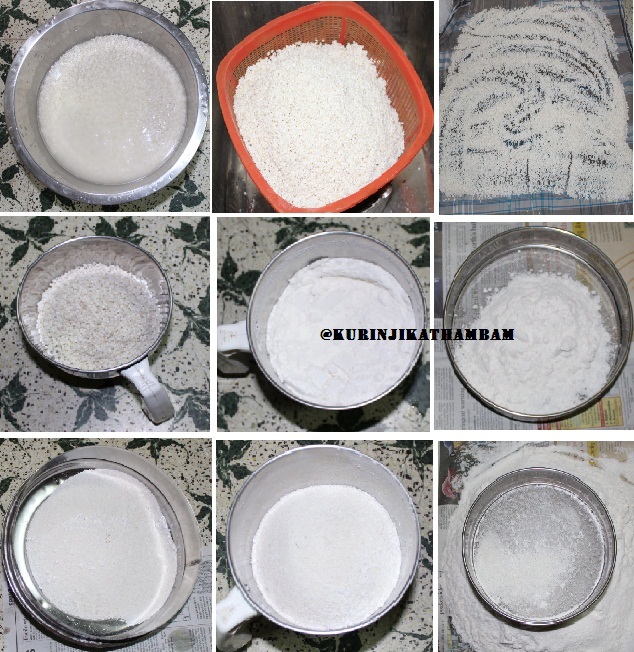 Close the flour with paper and use the whole flour immediately for adthirasam. Because you can’t use this later because as this flour contains moisture. 1. Grate the jaggery or powder the jaggery using the hammer. 2. Mix 1 cups of water with jaggery and bring into boil. When the jaggery dissolves completely, then switch off the flame. 3. 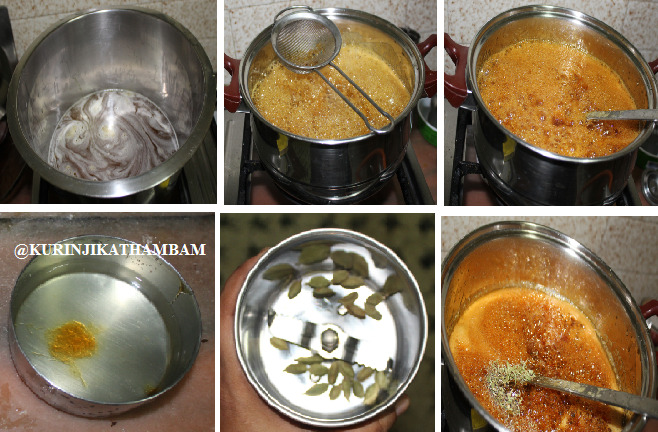 Strain the jaggery syrup with steel filter to remove the impurities. 4. Again boil the jaggery till it reaches soft ball consistency. Take water in a small wide bowl. Put 1 tesp of syrup into it. If it does not dissolve into the water and you are able to make soft ball then this is the correct stage. Now switch off the flame immediately. 5. Grind the cardamom into fine powder. Now put the powdered cardamom into the jaggery syrup and mix them well. 1. 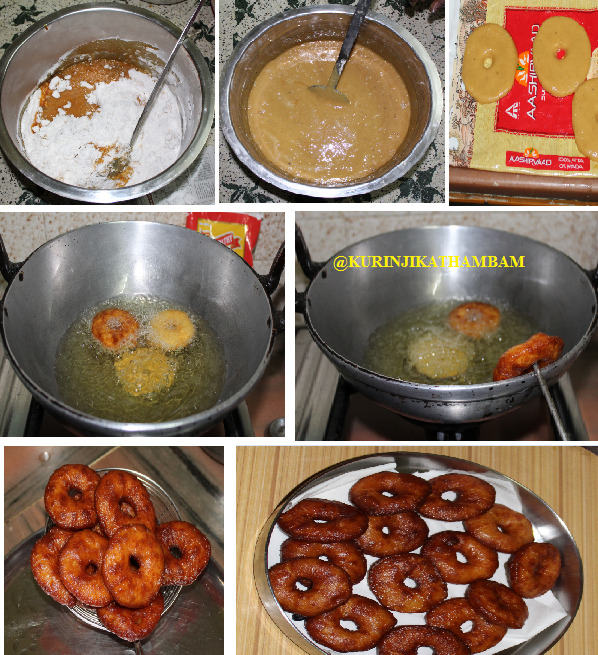 Now take the rice flour in a wide bowl, add the jaggery syrup little by little. 2. Mix them well with strong handle ladle. 3. 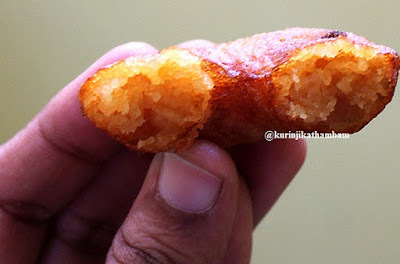 Now the batter looks like a bonda batter. Don’t worry about its consistency. 5. After two days, knead the dough with your hands. Now it should become thick dough like chapathi dough. 1. Heat the oil in a pan for deep frying the athirasams. 2. Divide the dough into lemon size balls. Grease the thick plastic sheet or banana leaf with oil. Place the dough on the greased sheet and press with your fingers into a 2mm thickness circles. Put hole at its center. 3. You can make 3-4 pieces like this and take each circle with your hand (just trun over the sheet over your fingers) and flip it into hot oil. The oil temperature should not be too hot but should be in medium hot. 4. Put 3-4 adhirasams at a time. (depends on your oil and pan). If it is cooked one side then turn over it to other side. Cook till they turn into golden color. 5. Take it out from the oil and strain the oil completely. Then place it on the tissue paper so that it absorbs the excess oil. 6. Allow it to cool down completely and store them in a air tight container. 1. You can have the athirasams even till 10 days if stored in room temperature. 2. Instead of preparing the complete athirsam and storing it for later use, you can alternatively store the dough in fridge and use it in batches. Please note that you should ensure that the dough comes to room temperature before fry. This is my favourite sweet.. I have book marked it.. I want to try it sometime. 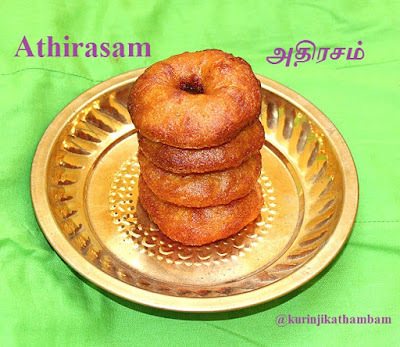 Can we make athirasam using basmathi rice as it taste exactly like raw rice.